Although it was a slow start today because of some early fog it turned out to be a brilliant day with several thermic flights. Early on it looked very promising when the light mist cleared at around 9am but 20 mins later very thick fog rolled in and stayed until around 10-30am. It then cleared very quickly and we started flying at 11am. From then on it just got better and better with 18mins in the T21 and a couple of flights of 20 mins and then 23 min and finally an epic 34 mins which I think is the best flight of the year so far. It was warm in the sun and stayed dry all day until we finished flying at around 4pm when the canopies started misting. A great day and well worth the wait for the fog to clear. Longest flight…………34 min, very well done to Ken M., a really good effort in light conditions. Second Longest……23 mins by David C. in the Junior, ……..as above. Followed by………….20 mins from David R. and Steve F. in HSM and Paul R. also in the Junior. And Finally……………18 mins by Phil P. in the T21, well worth a mention as he got to 2200′. I think it was the cold that brought him down !!! 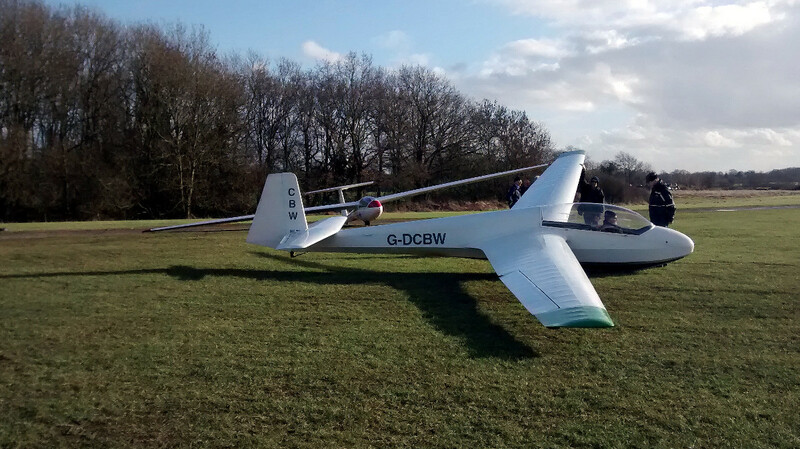 This entry was posted in Flying reports and tagged flying report, winter flying by admin. Bookmark the permalink.